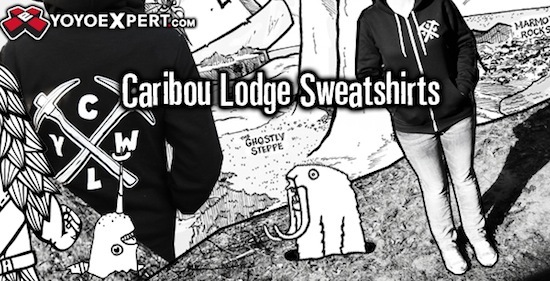 Caribou Lodge, the Canadian dynamic return top company has just released their first hoodie! This sweatshirt shows off their awesome double pickaxe/CLYW logo on the back and front! The zip down front and hood allow the sweatshirt to be worn comfortably and come off and on with ease. The black and white logos are prominently displayed on both the front and back! These are also the perfect hoodies manufactured by the high quality American Apparel clothing brand. They fit perfectly, they go with everything, really warm and fuzzy, and are made from high quality material so they will last! Stay warm while showing off your YoYo style and love for CLYW! Note: American Apparel Brand Hoodies do fit to the body tighter then most so we recommend purchasing at least one size larger then your normal t-shirt size.